We get to spend time with some really great students through the English Club and the Outdoor Club at Corvinus University. 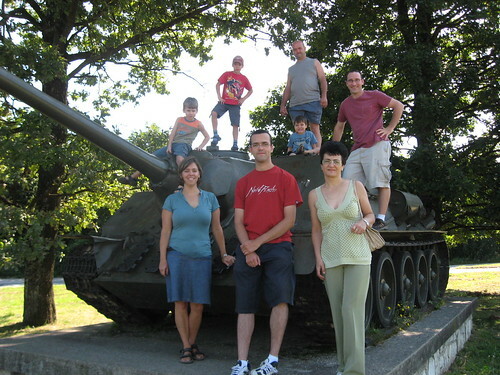 One of our friends, Norbi, invited us to visit his home in Slovakia for a few days. So this past week, we spent a couple days in and around Kassa (Kosice) Slovakia with Norbi’s family. We had such a great time. 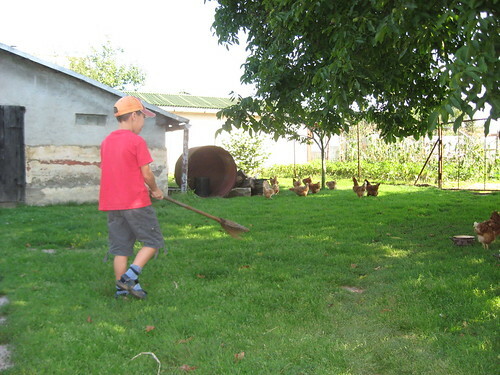 Their family lives in a small village 40 minutes outside of the big city (250,000), and the kids loved being in the countryside for a while, eating home-grown vegetables, picking grapes, and chasing chickens. 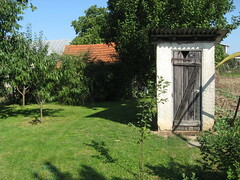 Standing in the backyard are grape vines, apple trees, a giant walnut tree, a vegetable garden, a chicken house, and an outhouse which hasn’t been used for a long time. The outhouse, for me, was the coolest. Seth was a bit bummed that we couldn’t use it. Me too. It was a cool imprint from an earlier time, and I’m glad they haven’t torn it down. The kids loved the chickens, and I’m thinking that we are going to have to get a few pet chickens soon. Thanks Norbi for hosting us! !